So we know you know we serve hot, made-to-order breakfasts in our Garden Grille Cafe at the Hilton Garden Inn hotel Orange Beach AL. So good, in fact, we welcome local police and firemen, residents and hotel guests here every morning. But when you feel like venturing outside the Garden and into this great community, we can tell you the best places to dine in and around Orange Beach. Have your first cup of coffee here, then go explore. Here’s our list of our favorite spots for eggs and bacon (along with special treats only available in these parts). This restaurant is a chain that doesn’t feel like a chain. With strong Cajun roots, you’ll find items like beignets (little doughnuts dusted in powdered sugar), pancakes, french toast, omelets and benedicts ranging from traditional to soft shell crab. In the mood for a cocktail? Don’t miss the ‘choose your own adventure’ Bloody Mary Bar. Brick & Spoon has been rated one of the ‘Top 10 Breakfasts in the U.S.” by Travel + Leisure. Another chain restaurant that started small and expanded throughout the Gulf Coast, Another Broken Egg serves a broad menu of breakfast staples, from oatmeal to waffles, creamy grits to huge cinnamon rolls. 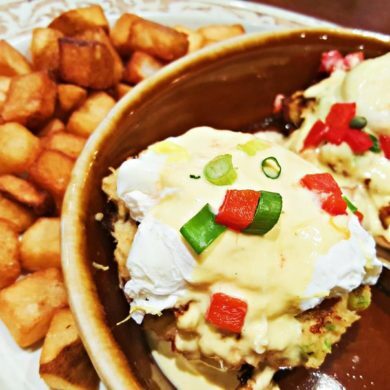 The Crab Cake Cavallo replaces the traditional English muffin with a crab cake, then tops it with Andouille sausage infused Hollandaise. There’s a lobster and brie omelet, and shrimp and grits if you want to try a taste of the South. Take home a signature hand thrown pottery mug. This local cafe was inspired by a ‘duck who flew south for the winter’ and landed here in Orange Beach. Duck’s supports local agriculture and artists by putting their ingredients in the food and paintings on the wall. Try signatures like the Banana Stuffed French Toast and Creole Grit Cakes with Garlic Toast. You can also find surefire bets like eggs and bacon, country ham, biscuits and gravy and more. Originating in New Orleans — home of Southern Creole cooking — the Ruby Slipper has made its way to our shores, offering Louisiana-style favorites like BBQ Shrimp and Grits, Eggs Blackstone (applewood smoked bacon, grilled tomato and poached eggs on a buttermilk biscuit smothered in Hollandaise) and Southern BLTs. There’s also a great kid’s menu and fancy adult beverages. A true mom and pop that’s been around since 1957, this little hole-in-the-wall is tiny, with checkered tablecloths and friendly service that’ll make you feel like it may actually be the 50s. (Ahh, simpler times.) With a breakfast buffet and omelet bar serving anything you can dream up, it’s a perfect place to stop on your way out of town. The breakfast is delicious. The Wi-Fi is free (and fast). The walls are decorated with local, reasonably priced artwork. For country cookin’ that’s easy on the wallet, this is the place to be.